Chocolate. Can there ever be too many ways to eat chocolate? No. At the school where I teach there is a chocolate box in the front office, dutifully stocked by the school secretary who knows what people need to continue functioning. Dessert for me means chocolate. Occasionally I come across a dessert that wows me without being stuffed with chocolaty goodness, but this is not the norm. 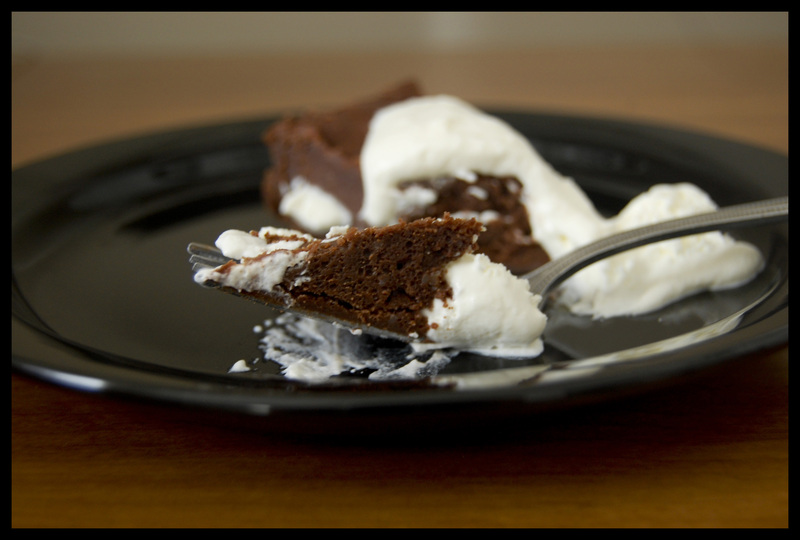 For people who really love chocolate, flourless chocolate cake recipes are an endless temptation. I discovered this recipe while I was living in France, and made it multiple times. The finished cake took up almost an entire shelf of my tiny apartment fridge, but it meant that I could come home from work and eat forkfuls of paradise . . . or start the day off with a chocolate rush. Two of my friends visited me in France and I welcomed them with this cake, which we munched on the remainder of their visit. One of them has since been diagnosed with a gluten allergy that seriously restricts her dessert consumptions. Luckily, this chocolate cake is already gluten free. When you have that much butter, sugar, heavy cream, and dark chocolate, who needs flour? Taken from some French cookbook in the house where I nannied, and converted out of metric using the website here. Preheat the oven to 350. Grease 10 in round baking dish. Sometimes I cheat and do two smaller ones. Melt butter, chocolate, and cream in the microwave or a double boiler. If using the microwave, be sure to stir the mixture every 90 seconds or you will scorch the cream and chocolate and have no wonderful chocolate cake. Gradually add the sugar, stirring till it dissolves. In a separate bowl, beat the eggs lightly before slowly adding them to the chocolate mixture. Pour into the prepared pan(s) and cook 40 minutes. The cake will crack slightly on top and puff up. Leave the cake to cool for at least several hours, than preferably overnight in the fridge. It will quickly collapse as it cools, providing a wonderful dense cake. Serve with strawberries and unsweetened whip cream. This entry was posted in Uncategorized and tagged baking, chocolate, Cooking, food, Gluten-Free. Bookmark the permalink. 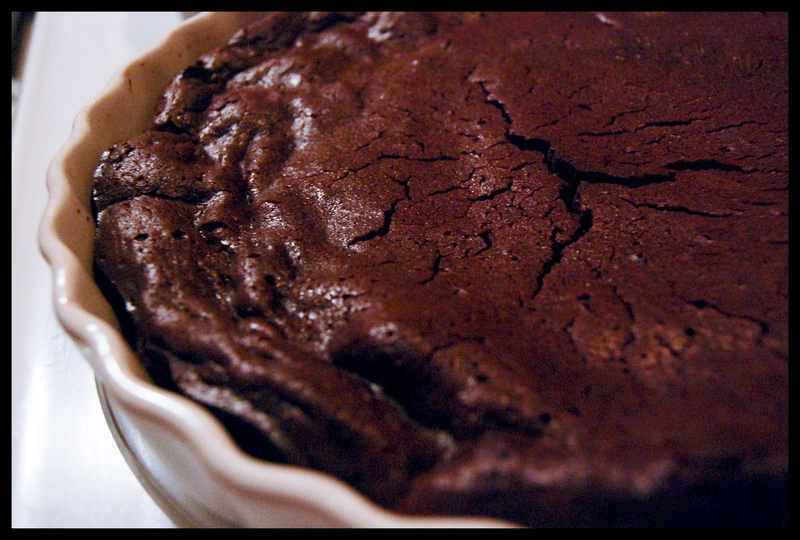 I found this flour-less chocolate cake recipe when we thought Philip was GF, and it is always in high demand. I also recently made almost flour-less fudgey torte mini-cakes that were like a piece of fudge wrapped in a brownie. Maybe we should just take flour out of everything? Oh that does look good! I also recently made the smitten kitchen pear chocolate tort with gluten free flour and it tasted surprisingly normal. Just to be on the safe side though, I did double the amount of called for chocolate chips. Pingback: Christmas Eve fire and Christmas Day fun. | notes "just so"